"Every mistake I have yet to make." Our love story fell apart when he saw her. But then again, maybe that's when it really began. 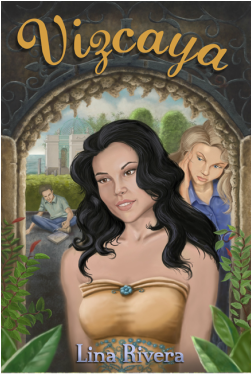 Nikki is a self-motivated teen whose life is exactly how she wants it, but that all changes when she goes to the Vizcaya Museum and Gardens to work on a school project. There she meets a spoiled rich girl named Nelli who is only interested in one person - Nikki's boyfriend, Diego. In this coming of age novel, an unlikely friendship is born as the three teens embark together on a path of self-discovery, but that friendship is threatened when Nelli finally tries to make Diego hers. Nikki and Diego's love story fell apart when they met Nelli. But then again, maybe that's when it really began. Purchase Vizcaya on these great sites! Just click the links and they'll take you directly to the Vizcaya page. Want to know what people are saying about Vizcaya? Check out these great reviews! "Vizcaya was well-plotted even though it was written in three first-person POVs. It gave us fair insight into each character’s emotions and their voices really drew me in." "In general this book read like an episode of “Gossip Girl” and it kept my interest all the way through. I think this author has a really promising future and I would recommend this to all young adult readers." "It's about growing up, about the path of self-discovery on which teenagers figure out who they want to be, what they want to do with their life, who is the real friend and who only pretends to be." "It was surely a 5 star for me, because I could easily go back over the favorite parts I like and re-read them with just as much joy as the first time. I'd recommend wholeheartedly to any lovers of YA"
"The relationship building in this book is strong, and like I said, I liked that we actually get to see teens develop and grow over several years instead of weeks or months." "..it was like reading an episode of Gossip Girl and I liked that. Proud to read a young adult novel centered around Latinos!" Check out these great Vizcaya links for more information!